All NiceRink® liners are engineered, multi-layered, high-strength, tear-resistant and cold-crack tested, made to withstand the rigors of winter. 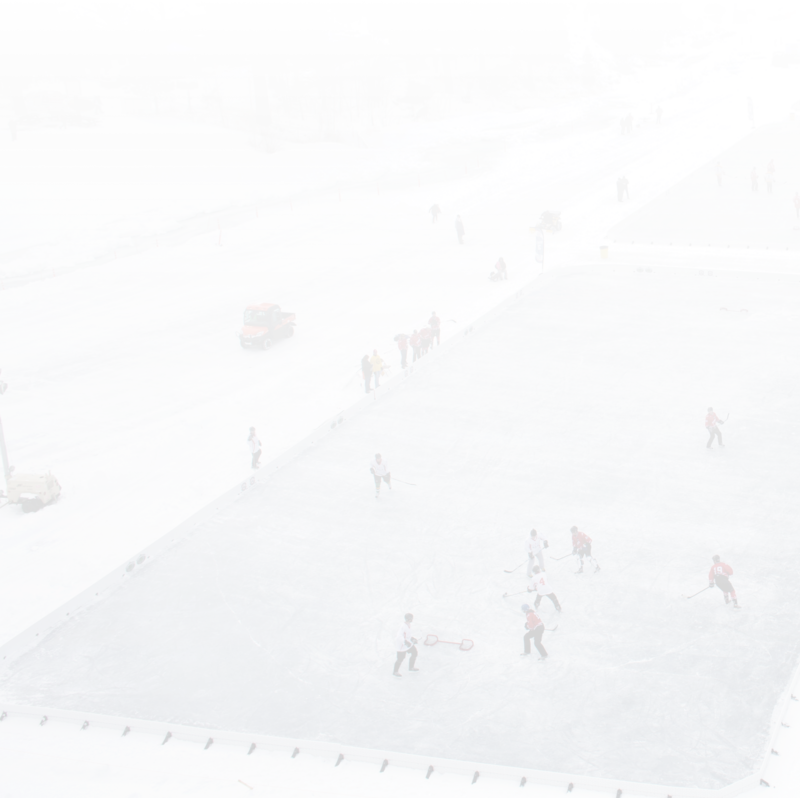 NiceRink® brackets eliminate the need to “build" a rink. They are easiest to use and quick to install, providing the BEST overall sideboard support system. Create the perfect perimeter for your rink. NiceRink® interlocking High-Impact Plastic Boards are lightweight, long-lasting, sturdier, and “cleaner” in appearance than wood boards. NiceIce® Resurfacers, BumperCaps, KickPlates, goals, training products, and MUCH more -- everything you need to assemble and maintain your perfect backyard ice rink. Everything you need to know about liners, sideboards, brackets, accessories, and pricing. How to set up your NiceRink® backyard ice rink with easy-to-follow instructions and helpful videos. Answers to what you want to know about NiceRink® products and shipping information, plus set-up tips, troubleshooting, and where to buy our products. We’ve been making the best backyard ice rinks since 1991. Learn more about our fourth-generation family-owned business. We are committed to providing exceptional products that help develop each skater’s creativity and abilities without limitations. It might surprise you to learn that up to 67% of teens in America say they'd like to spend more time with their parents. One way to bridge that hormonal gap might be building an ice rink in your backyard this winter. If your son or daughter loves hockey, ice skating, or any winter activity, building your own DIY ice rink is a great bonding activity. There are a number of options for all of these materials, so how do you know where to start? First, decide how big you want the rink to be. Once you have this crucial detail, then you can start to find the right materials for your home ice rink. Common sizes for backyard ice rinks include 20'x40', 25'x45', 14'x36', and 28'x78'. For the most experienced DIY practitioners in the world, you can purchase everything you need to build a home ice rink at your local home improvement store. With lumber, metal brackets, ice rink liners, tarps, and lots of building experience, you can put together a bare bones ice rink. However, there is an easier way to find all of the materials you need to build an ice rink year after year. NiceRink provides starter kits that include everything you need to build your own ice rink, including sideboards, brackets, ice liners, and ice resurfacing tools. While wood can be used as sideboard material, thermoformed plastic sideboards not only create a much tighter seal, but they can also be easily stored and re-used in the following years. Our basic starter kits also include the brackets and durable ice rink liners you'll need to create a watertight seal. In addition, some people choose to cover their ice rink during the day with a tarp. Not only do these tarps need to be massive in size, but they must be a bright color as well. When the sun shines in the winter, even if it is a cold day, the heat can melt your rink if you aren't careful. For example, if you use a standard blue tarp as your liner, the dark color under the ice will retain more heat than a reflective white liner. UV rays can wreak havoc on your rink, so make sure when choosing a liner to choose the one that's most reflective. Toughness matters as well. That's where NiceRink sets itself apart from the rest of the backyard ice rinks. Our liners are tougher than the competition and have stood the test of many happy families over 25 years of proud service. If you've decided to build a backyard ice rink, make sure not to get a flimsy, cut-rate liner or you'll find a ruined lawn when spring comes. With NiceRink, winter brings frozen joy and family fun. Whether you're a backyard rink rookie or veteran, we're excited you want to hear from NiceRink about special offers, new merchandise, and all things skating and hockey. Fill out the short form below, and watch your inbox. Welcome to the NiceRink Family! ©2019 NiceRink. All rights reserved. Sign up to receive the NiceRink catalogue by mail. Sign up to get the NiceRink catalogue and a world of Frozen Memories® delivered to your mailbox.